Everyone loves a good spreadsheet! This kind of thing never happens to me, or at least not as much as I would like it to, but it’s been happening a lot lately. Saturday I got a check in the mail. It was a check that I wasn’t looking for that was just sent to me out of the blue. Don’t you just love that? A side story…Back in May I was talking with a group in LA that was mostly automated in accounts payable. This is a rare thing for me, because I usually talk with groups that are drowning in paper. I was happy to do the talk because no matter how automated you are, doing an analysis of your processes can do one of two things for you: (1) show where improvements need to be made, or (2) validate that your are on the right track. During the talk I gave I realized that if you do a cost per invoice/cost per process study, then what you are really doing is taking the aspects or the outcomes of the automation software and putting them on a spreadsheet. It was quite the realization, and when I announced my newfound knowledge it really resonated with the group (I let them think that I knew this fact all along). 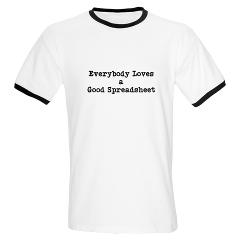 This proves the fact that “Everyone Loves a Good Spreadsheet”.